By nature academic, essay writing should be stylised in a way that allows the reader, both the teacher as well as any other person reading the text, an unbiased view of any problem. The reason behind this is because, the reader needs to be allowed to form their own opinion about the subject matter in question. Not following this basic principle makes the essay in question read more like a work of fiction than anything else, a situation that should be avoided at all costs. For most students however, writing in an impassioned way is one of the hallmarks that define their style of writing. Ever excited and enthusiastic about their subject matter, such writers are comparable to the Crusaders, foraging ahead in any way possible, bent on just one single purpose that must be accomplished at any costs: ensure that the reader is made to think from your own point of view. There are any number of reasons why students, in particular, really need to start writing in a more unemotional and unbiased style of writing. The first and most obvious reason being that it is not a norm for academic writing and so is sure to get the student penalised, one way or the other for writing in an emotive style. However, there are many other reasons that must be kept in mind here. When writing any essay, students generally begin by researching the topic that they have been asked about. This is followed by a plan or an outline of just how they are going to write and finally the writing of the work itself. This is where, especially if the topic is one that the writer is very passionate about, students begin to start getting really excited about the subject matter. Consider for instance, having to write about something like the issue of gay rights in the country. There is no in-between path that you can choose from in this topic, you either support the issue or you do not support the issue. Either ways, emotions can run very high when writing on any such topic. What is worse, those emotions tend to translate on to the paper also. When that happens, the student in question allows their writing to become more emotive also. No matter what the topic may be, it is important to carry out a lot of research to ensure that you have a lot of points to fall back on whenever you start writing. Most writers, when they no longer have anything else to talk about, unconsciously fall back to a more emotive style of writing. Before starting the essay, it is important to know what your purpose is, then start writing. As students lose focus, they again start writing in a more emotive tone. Finally, there is nothing like editing work properly. 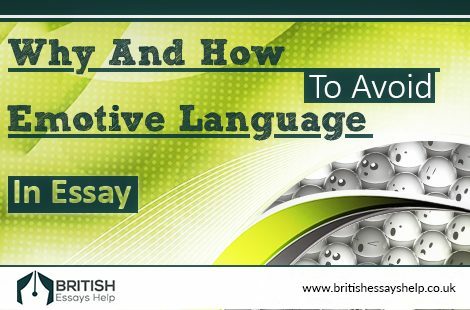 Reading work, removing all emotive words and phrases, is the best way to avoid it in your writing or take British Essays Help!